The UK is the key hub in Europe for VR and AR technology and we are keen to celebrate this by showing the depth and breadth of British VR/AR organisations. 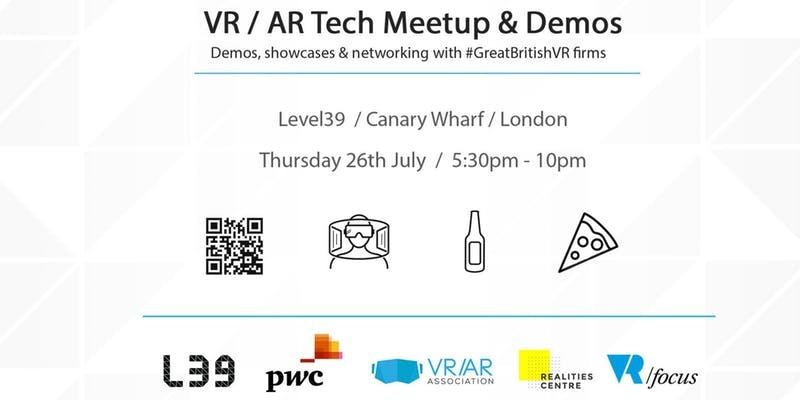 To this end, Level39 have teamed up with PwC’s VR division, VRARA, the Realities Centre & VRFocus to throw a different type of VR/AR exhibitor and demo meetup on Thursday, 26th July. Level39, Blue Hire, Blippar, Zappar, INITION, Octagon Studio, The Third Floor Inc, Zeg.ai, Auggd, VRGO, Blend Media, immerse.io, Admix, PwC, MutinyMedia, VividQ, HappyFinish, Revolut, WeLendus, YourParkingSpace, Upslide, Alibaba Cloud, VRFocus and Realities Centre.